*Background: Our home is new construction. We knew the stone is a facade, about 1/2-1" thick, and is hollow behind the drywall. We actually took off the electric plates and used a flashlight to see what we were dealing with inside...just the exhaust for the electric fireplace. Niiiice. *We borrowed an awesome stud finder from our neighbors, huge, huge lifesaver! Once we determined where the studs were located, we actually DREW directly on the stone the rectangle where the studs are located, where the rock/drywall needed to be cut out. 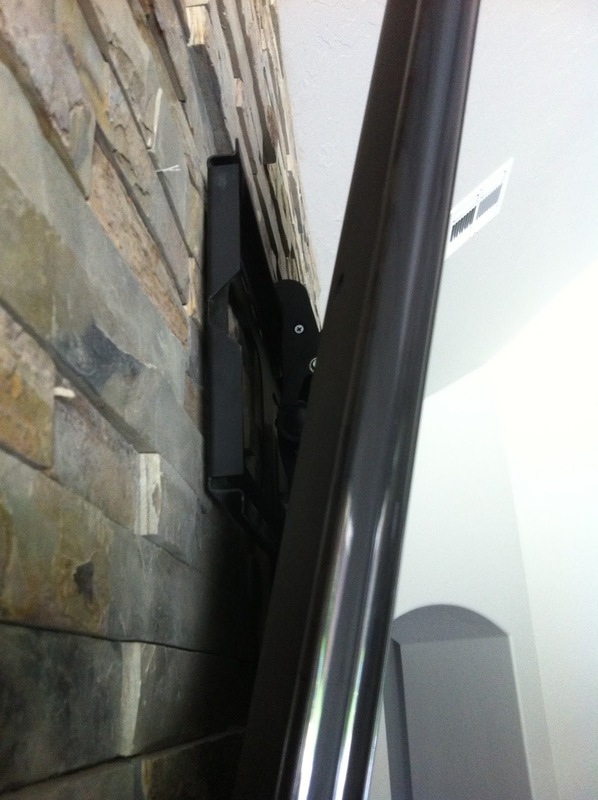 We started with the TV on the cabinet, but I like the symmetry of having the TV mounted. I especially like that the kids can't touch it. 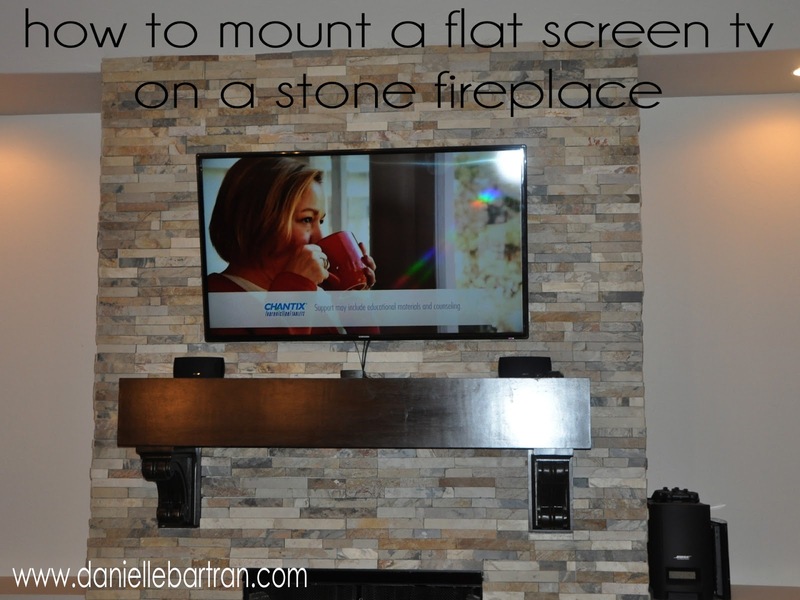 If you are considering mounting a TV, keep in mind the height of the TV if you are hanging it above a mantel. 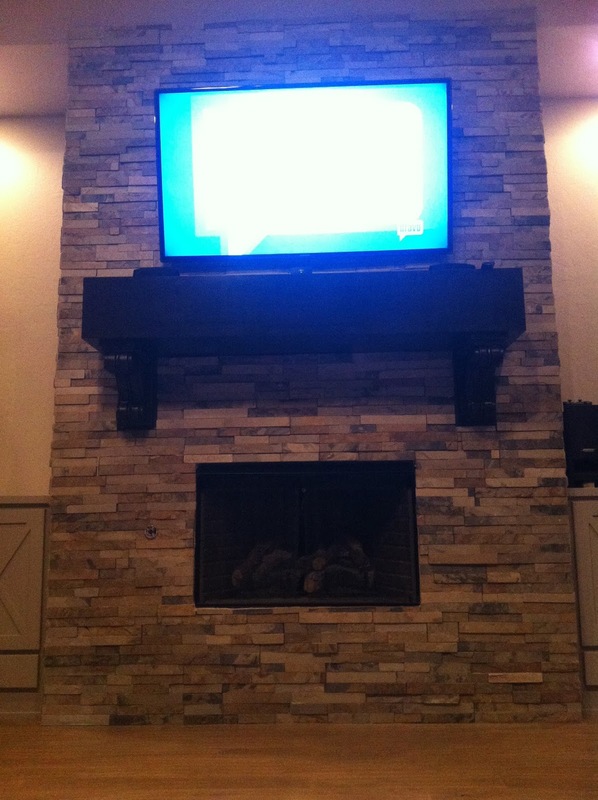 Our mantel is high, so our TV is mounted extremely high: makes for terrible ergonomics. I mostly watch TV laying down on the sofa, so it's not a huge deal, but it does stink to have your neck craned back trying to watch a movie. This was an extremely messy/dusty disaster. Our shop vac was just blowing around the very fine dust all over the place. My husband was working alone, I was out of the house...and when I came home there was dust on EVERY SURFACE (the negative side of an open floor plan) so definitely cover furniture, tape off/close doors, etc. Be ready to clean when you're done. Once the wires were properly fed through the opening (check with your mount to make sure it will fit around the wires) the next step is actually installing the mount. As you can see in the photo above, my husband cut the stone wide enough to fit a piece of 2x4 wood, long enough for the bracket we purchased. 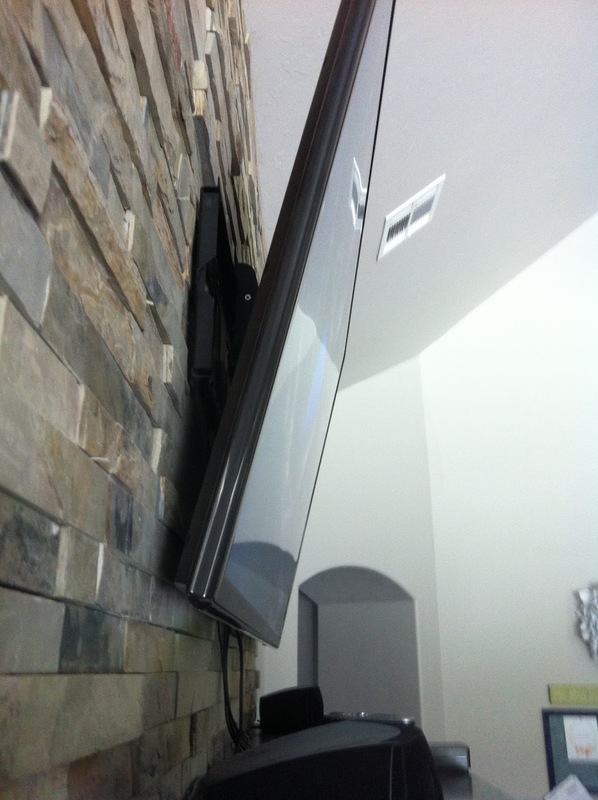 He screwed the 2x4 directly into the stud + followed the mount instructions to attach the TV mount onto the wall. Here is the very up close side view of the back of the mount. And just for the fun of it, here are a bunch of terrible pictures of the mounted TV...terrible lighting, odd glare, what was on the TV?! We are going to buy a Radio Frequency Remote (the one we have isn't compatible with the Bose) that will work with the cable box inside of the cabinet (you can see the open door of the built-in on the right of fireplace.) 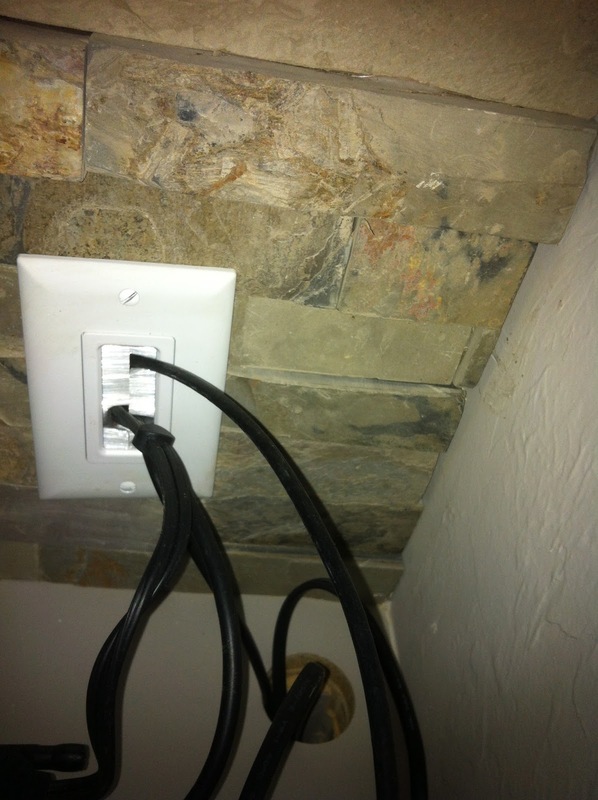 And then we'll have to figure out how to hide those exposed wires...I might crochet some yarn over them...too artsy? Have you ever done a project like this?